We often link nutrients in food to health outcomes, both positive and negative. Vitamin C in oranges is linked to scurvy prevention, iron in red meat to the prevention of anaemia; calcium in dairy products is synonymous with strong bones, teeth and the prevention of osteoporosis; too much refined sugar in lollies and sweets is connected to dental caries and rotten teeth. Another example is the fat component of dairy foods which is mainly saturated fatty acids (SFAs). SFAs are commonly found in foods of animal origin (for example, meat and chicken with visible fat), full-fat dairy products and plant fats like palm and coconut oils. According to the Heart Foundation, the recommended saturated fat intake is 7 per cent of total energy intake, as high consumption of SFAs has been associated with increased total cholesterol production and low density lipoproteins (LDL, commonly called “bad cholesterol”), key risk factors for cardiovascular disease. Consequently dietary recommendations often promote consuming lean meats and low or fat-free dairy products. Isolated nutrients may behave in a certain manner, but we eat food – not individual nutrients. It is becoming more evident in nutrition research that not all foods behave the same way as our body does not always absorb the components of food in isolation. In order for nutrients to become bioavailable (absorbed and able to exert an action), they must first be bioaccessible (that is, released) from the food matrix. ...the message that all saturated fatty acids in dairy products are bad is an oversimplication. Recent research focusing on the effect of calcium’s interactions with cholesterol production and lipid excretion is shedding new light on the role of the food matrix of different dairy products on cardiovascular disease prevention. Cheese is synonymous with flavour, rich foods, French cuisine and high LDL cholesterol. Nevertheless cheese is also a source of calcium and therefore role of the food matrix on cholesterol production was examined recently and found different effects from cheese and butter. In a 2014 study, University of Copenhagen researchers examined the effects of three different dairy diets on 15 healthy male subjects. While the base diet was nutritionally formulated to be equal, the control diet did not contain any dairy products and was supplemented with 500mg Ca/day whereas the two test diets contained a higher calcium content (1700mg/day) from the addition of either semi-skimmed milk or semi-hard cheese, foods that also contain SFAs. All the subjects spent two weeks on each of the diets to allow a complete comparison. The subjects’ LDL and total cholesterol levels were tested, as were the fat levels in their faeces for each two-week period. The result? 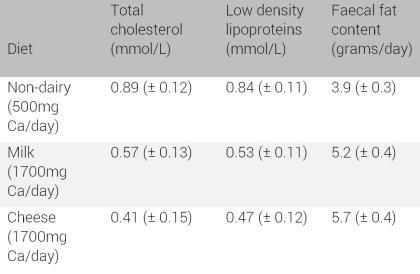 Despite the higher saturated fatty acid in dairy food diets, participants on the milk and cheese diets showed consistently lower cholesterol levels indicating a decrease in cholesterol production (including LDL cholesterol). Furthermore fat content in the faeces was actually higher in the dairy diets than the non-dairy diet indicative of fat passing through the body than being absorbed. Although changes in blood pressure, lipid ratios and triglyceride levels (risk factors for cardiovascular disease) were minimal between diets, the results clearly indicate that regardless of food source, dietary intake of sufficient dairy calcium is a key factor in decreasing LDL cholesterol production while simultaneously enhancing fat excretion from the body, important in the prevention of cardiovascular disease. The distinct effect of a high calcium intake on decreased cholesterol production and increased fat excretion indicates that binding interactions between calcium and fats in the small intestine could be taking place, consequently decreasing fat absorption leading to removal via faecal excretion and therefore decreased cholesterol production. So what does this mean in everyday terms to the everyday person? Calcium is important for more than just strong bones. As long as you don’t over-indulge, there is no reason to shy away from the cheese platter.